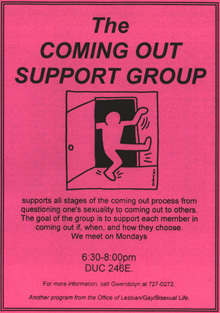 This coming-out support flyer, featured in the LGBT exhibit on display in the DUC, is from the early days of Emory University's Office of Lesbian, Gay, and Bisexual Life (now the Office of LGBT Life), founded in 1991. Credit: Office of LGBT Life records, Emory University Archives; MARBL, Emory University. The Manuscript, Archives, and Rare Book Library (MARBL), in collaboration with the Office of Lesbian, Gay, Bisexual, and Transgender (LGBT) Life at Emory University, is showcasing selections from MARBL's 2013 exhibit, "Building a Movement in the Southeast: LGBT Collections in MARBL" in the Dobbs University Center (DUC) on level one during LGBT History Month in October. The original exhibit was co-curated by Randy Gue, MARBL's curator of modern political and historical collections, and Kelly H. Ball, a doctoral candidate in women's, gender, and sexuality studies. This condensed showing of the exhibit will run through Nov. 2. Visitors may view the display any time the DUC is open at no charge. The exhibit explores the history, culture, public health initiatives and politics of LGBT communities in Atlanta and the American South. Featuring wall panels that show letters, photos and other materials, the exhibit highlights the MARBL collections of playwright and activist Rebecca Ranson, The American Music Show and AID Atlanta in addition to Emory University's own archives. Kathryn Dixson, exhibitions manager for Emory Libraries, hopes that students will be particularly drawn in by the personal connection Emory contributes to this history. For example, when what is now called the Office of LGBT Life was founded in 1991, Emory became one of the first universities to provide specific support services for LGBT students; in 1995, Emory became one of the first universities in the Southeast to offer healthcare benefits to domestic partners (University Archives records documenting student groups, controversies and campaigns for policy change go back to 1972). The exhibit's location in the DUC near the student organizations is important as well. "One of the goals for MARBL and the Woodruff Library is to extend the outreach of our collections and exhibits beyond the library walls," Dixson notes. "We hope this exhibit in the DUC will heighten students' awareness of the history of the LGBT community on campus and throughout the Southeast, and Emory's important role in preserving that history." Michael Shutt, interim senior director of the Center for Diversity and Inclusion, agrees. "My wish is that people will see and understand their place in history better," he says. "The collection is about increasing awareness not only of sexuality and gender, but also of race and class, which are often left out of our histories. I also hope this exhibit will draw more attention to the MARBL resources on campus so that we can grow and maintain collections as a community." MARBL has been working to expand its collection of historically significant LGBT materials. The complete collection, which includes materials and papers of prominent gay figures and organizations, is dedicated to documenting the history of Atlanta and its social justice movements.